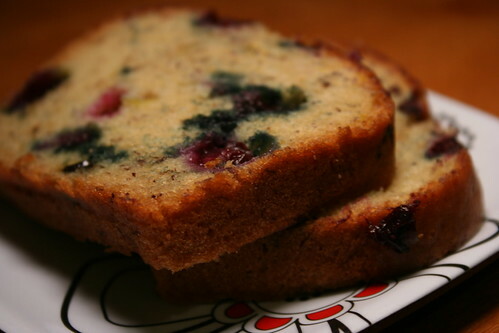 » Blueberry Lemon Bread Don’t Eat Off The Sidewalk! I’ve been making holiday breads for the next issue, and I had some blueberries so I decided to make blueberry bread. Since blueberries are more of a summer thing, I decided to just put the recipe up here. It’s not too lemony, just enough. Also, I used banana instead of soy yogurt for the egg because I have lots of ripe bananas, but I couldn’t taste it at all. On the flipside, my husband said he could taste it a bit and when I asked about the lemon flavor he said, “There’s lemons in this?” Go figure. Also, I was baking all of these in those disposable (reuseable if you wash them carefully) foil pans because they’re intended as easy gifts for the holidays, and they’re slightly smaller than your standard loaf pan. So if you make it in a regular loaf pan, it won’t fill it up all the way, but it won’t really hurt anything. Preheat the oven to 350 and lightly grease a foil loaf pan. In a medium bowl, sift together the flour, baking powder, baking soda, and salt. In a large bowl, whisk together the banana, milk, oil, sugars, lemon zest, juice, and extracts. Add the dry to the wet, and whisk until it’s mostly lump free. Gently fold in the blueberries. Pour into your greased pan. Bake for 45 minutes, or until a toothpick inserted in the middle comes out clean.